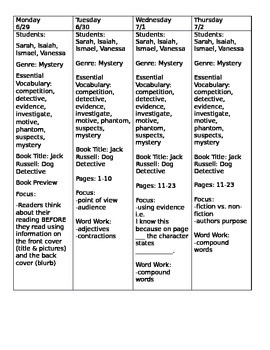 This set includes 12 days of guided reading lesson plans for Jack Russell: Dog Detective The Phantom Mudder, AND comprehension questions for each chapter to gauge student understanding. This is a response guide that can be used during guided reading, literature circles, or as an independent book study. It contains comprehension questions, context clues, text features, writing, and grammar/ phonics skills. This is a great way to introduce chapter books, because it breaks the book down into manageable sections. Check out the preview for a quick sample of the lesson plans and the response guide!